One of the first things you should do if you see anything you don’t like online, whether it is inappropriate material or unwanted approaches, is to contact a responsible adult, such as a parent, carer or teacher. You may also be able to report incidents yourself. 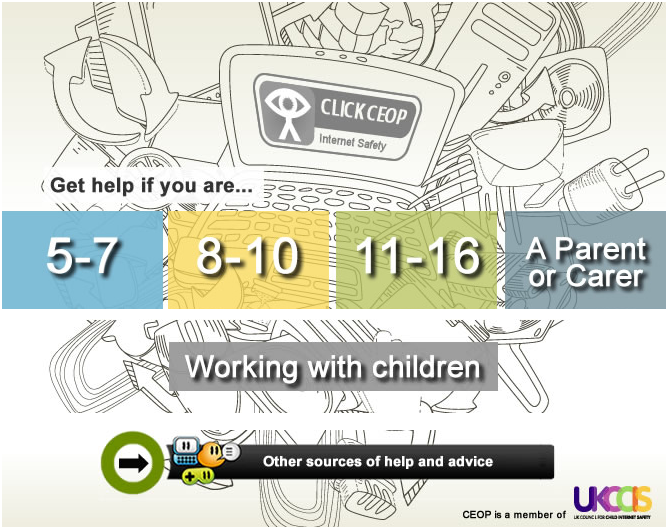 Many websites, including Windows Live Messenger and Facebook, incorporate a Click CEOP button, which will put you directly in touch with the Child Exploitation and Online Protection Centre run by the UK police. If the website which you are worried about doesn’t have this button you can find it on CEOP’s own website: www.ceop.police.uk. Clicking this button will give you access to advice on what you can do if you are experiencing problems relating to Cyberbullying, Hacking, Viruses, Mobiles, Harmful Content or Grooming. Congratulations! You’ve now reached the end of this section of the course. Remember, you can return to any section at any time by clicking on the menu near the top of the screen.